Welcome to my summer home tour. For a little background info my husband and I designed and built this house twenty years ago doing much of the work ourselves to save money and there has been much updating over the past ten or more years and of course there are a few more things that still need updating. My style has certainly changed since 1995 and I have been updating to the look I like now.....and things are tweaked pretty frequently so be sure to stop back by. Summer to me is all about the beach with a bit of Americana thrown in since summer conjures up memories of trips to the beach and celebrating July 4th. Even though my home is French country style with some French farmhouse style thrown in it is easy to mix in some coastal decor for summer. 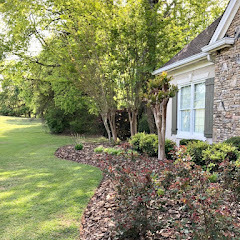 I've been working hard in the front yard and soon the back yard will get a much needed makeover. Well, don't just stand there. Come on in. Oh, and if you can see the mess through the windows in the back just ignore it. That is the deck makeover in progress. Some coral and flowers were added on top of the large French chest in the foyer. 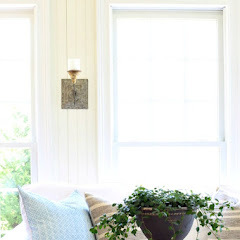 I just recently shared my summer foyer. This is the sitting room on the left. This room is filled with a mix of new, old and collected. Straight across is the dining room. This light filled room is filled with many pieces of furniture that I have transformed with paint. I'm loving these stock flowers. The dough bowl has been filled with the large fishing float I recently found in an antique mall and some smaller floats purchased on ebay. I also added many shells collected over the years along with a couple sea fans. I even tucked in a piece of coral in one of the ironstone dishes in the hutch. Where are my manners? I haven't offered you anything to drink. I have some refreshments set up in the breakfast room on my antique French farm table. Have you tried these French lemonades? I like the Lorina one the best, but it isn't lemony enough. I even have lemon slice glasses, that I bought at The Dollar Store a few years ago, to drink it in. You can grab a straw if you like. I prefer to drink without one. We'll just go through the kitchen and I'll show you to your room. I just can't get enough of these stock flowers. I have to drive 45 minutes one way to Trader Joe's to get them, but they are so worth it. They are cheap, smell great and last a long time. You are probably tired after your long trip and you may want to rest a bit. I hope you like hydrangeas. I clipped these and thought they would look nice in this blue ticking striped bucket. I had put this sea gull picture that I shot on Martha's Vineyard away, but had to pull it back out for summer. It reminds me of the super foggy day there. I took that picture through a restaurant window while enjoying lunch and then had it made into a canvas. I added some shells and sea glass so you will feel like you are away at the beach instead of outside Hotlanta. Don't you love these pillows I found at HomeGoods? They have some great ones this year and you can't beat the prices. I do have a bit of a pillow addiction. I found the octopus pillow first and then found the colorful shams in another HG store. Great colors and they are quilted. These are by Tommy Bahama. Can you believe they were just $16 for the pair? Now, that's my kind of decorating. I brought the Ikea duvet cover back out. Nothing like blue ticking for summer. I changed out the heavy lined drapes to these linen ones from H&M. Linen and summer just go together and I am wearing linen a lot this year. This is another cute pillow from HG. I sure hope your stay is comfortable. I'll let you freshen up and rest a bit and we will finish the tour a bit later. See more of my home Here and come back often as it changes often. Thank you, Sherry. Gosh yes it is way too hot! Thanks, Kelly. Yes, that fish pillow leaped into my cart! I love how you so beautifully incorporated that summery coastal feel into your home of French Country Farmhouse....so very well done....and love all the beautiful summer pillows...and must say one of my favs it the great seagull pic that you took on Martha's Vineyard. Now may I have a glass of lemonade please?! Thank you my friend and of course you can have a glass. I have the same octopus pillow from Homegoods! Love your home! Don't you love it? I gasped when I saw it. Such a fabulous price, too. what a hostess. a true southerner! even though i think you have a bit of a pillow issue, all of those pillows are so perfect for that summer guest room! i need to start going to HG, i hardly go. Everyone on this home tour is just blowing me away and your home is no exception! I always adore your style and the way you decorate - your summer touches are gorgeous and don't you know that I'll be stopping by Trader Joe's today to see if they have any stock! LOVE it! Thanks, Julie. I have a long haul for those flowers and never even heard of them until the other day. My house smells good. Your home is so gorgeous, Kim! Love those pillows! Everything looks so fresh and summer-y! I love the coastal touches and pops of light blue. Very refreshing. What a fun post! You have a lovely home! The front yard is gorgeous, and I love the fabulous sitting room and that BEAUTIFUL hutch! Thanks for visiting and that hutch is my favorite piece in my home. Beautiful home tour, Kim! You really know how to put things together. Wish I had those skills. Yay, good luck with the giveaway! Great tour Kim...your house is already for summer!! Thanks,Martina. All but the outside. 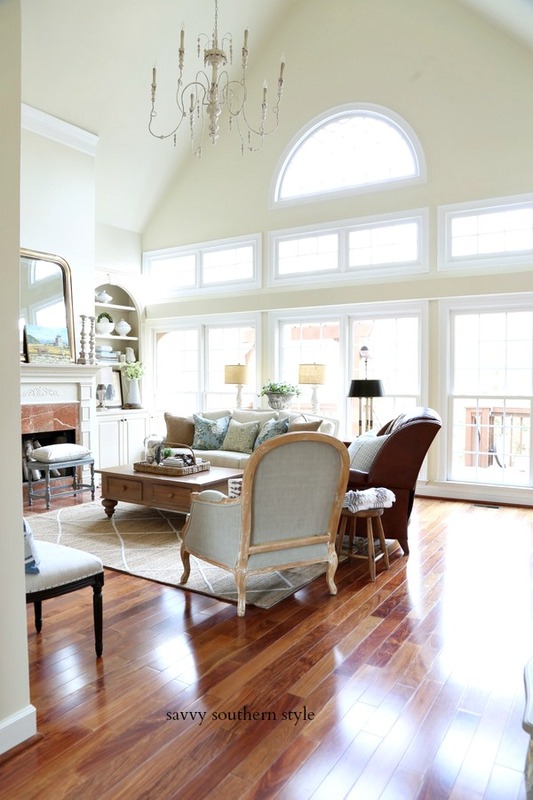 I never get tired of looking at photos of your beautiful home, it is one of my absolute favorites! Love, all of your decorating ideas! Thanks. Lauren. I love your home, too. From start to finish...just stunning. I am never disappointed when I visit your blog...your photography is literally perfect. I can't tell you how much I enjoyed this tour. Hope you enjoy the rest of your summer. Relax now! Wow, Ann thanks for the compliment on my photography. Don't really have a clue what I'm doing and I need to watch the videos from Shoot Fly Shoot. I take a gazillion to work with plus lots of editing. Yours is very good so that is nice coming from you. Kim, your house always looks gorgeous! You do such a great job with mixing things up and painting furniture for changes. Y'all have really enjoyed your house over the last 20 years, I'm sure. It certainly shows! Everything looks so pretty for summer. I always love your changes. Thanks, Marty. Yes, I'm always changing things up. I didn't know you designed your home! 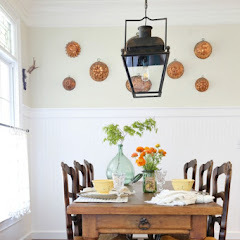 It's beautiful Kim - love all of your collections, especially the hanging bread boards - happy summer! Thanks, Kelly. Yes, we toured many homes for sale and then hubby drew up the plan on a napkin and then our friend drew it up on his computer. Your home is beautiful Kim! Beautifully decorated:) I don't know why, but I never noticed the seeded glass in the hutch before? I love it! Love the Foyer😍 I'd list everything I like about your home, but then it might turn into another home tour! Lol! Thanks, Cindy, yes that is one of the things that sold me on that hutch. Love all your flowers Kim, the simple fresh flowers and the dried ones hanging in your kitchen...they make your spaces fell lived in and effortlessly happy. I have a pillow addiction myself, your guest room is serene and fabulous! Thanks, Jenna for dropping in. I do love the dried ones hanging from my rack. What a great tour! I enjoyed seeing all of your coastal decor mixed in with your regular decor. I like how you styled the dough bowl on your dining room table. Thanks, Sis. Come by any time. Your home is gorgeous Kim! I am happy I had the pleasure of seeing it in person. I often reflect back on our RMS days and think to myself..we come a long way baby. Funny, the other day on instagram someone told me they been following me since RMS..I thought OH boy, I hope she was the nice one LOL! You and Mr. Savvy have done an amazing job and one you should be so proud of. It's always a treat to tour your home! Love the little coastal touches you added throughout. the pillows and the the canvas picture! Thanks for this wonderful tour, Kim, everything looks beautiful. I am mixing shells and coastal decor into my home right now too. I love that octopus pillow!!! And the shams were a STEAL!!! I saw a pillow similiar to your octopus one last night onj Pinterest and it was over $200.00!!!!!!!!!!!!!! Thank God for HG!!! I was just there yesterday. I have to drive 40 mins. to our Trader Joes too....but it IS worth it, I agree!!! Have a beautiful day. Thanks, Pinky. Yes, HG has the best prices and most pillows have down inserts which is what I prefer. Your house looks great Kim-I enjoyed the tour very much! I love all the wood pieces you have around your home! I'm ready to book my stay! ;-) Everything looks just gorgeous Kim and your summer touches are easy and breezy and just perfect. Love it all! Come on, girl your room is ready and thanks. Gorgeous home! I love the look of each room. 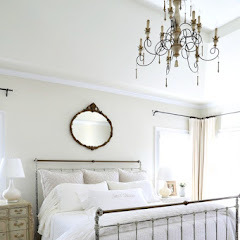 I adore the mirror hanging above the bed, could you tell me where I can possibly find a similar one? Thanks!! I found that in an antique store. Sorry and thanks for touring. Thanks for inviting me in to your summer home Kim! Everything looks lovely. I am lucky, I have a Trader Joe's 5 minutes from my house. I am going to check out those flowers you mentioned. Loved your home tour, it's always so grand to see several areas of your home at once and how you tie it all in together. Not sure what's my favorite area because it's all so amazing. Oh I could mention how much I have always loved your dinning room, that hutch is amazingly painted. Beautiful summer weekend to you and all it inspires you with. Thank you, Dore. That is one of my favorite painted pieces, too. Kim I love your home! The front is really gorgeous! Thank you for inviting us in!! Always comfy and delightfully appealing, your home looks great in it's summer attire! I really like the little lemon glasses - isn't it amazing what one can find in those dollar stores. You have a good eye Kim, not to mention your good taste. (raising those lemonade glasses) Here's to you and Mr. Savvy who's hard work has produced lovely results and Happy Summer! This is a lovely tour, makes me want to see more. Thank you, Cassandra and you can see more in my home tour on my side bar. Just click the photo. Love your beautiful home on tour. So pretty I went back through the pictures a few times. So gorgeous and comfy and cozy. Just charming to see all your pretty vignettes and rooms. Gorgeous Kim! I love your summery touches with the blue ticking and linen drapes. The fish pillow is so cute too. I love stock, I pick it up at my grocery store when I can't get to TJ's. Thanks, Mary. I wish they carried stock at my grocery store so I wouldn't have to drive so far. Your summer home is beautiful, as always! Thanks for having a drink ready for me, and I appreciate you getting your fabulous guest room all ready for me, too (love the coastal and colorful accents)! Happy Summer! Thanks, Becca. You know I love your coastal decor. Your summer tour was beautiful, Kim! The colorful colanders hanging from your pot rack add a fun touch to your kitchen. Thanks, Mary Alice. I do love my colander collection. Kim, your home looks amazing and you just have a knack of putting things together. Love those colorful shams, pillows, and those checked lampshades in the guest room. Makes me want to go pillow shopping! Thanks, Jane. Yes, go get you some new pillows. Gorgeous Kim! I love all the blues and greens. You are definitely ready for summer! Your home looks beautiful Kim. Love the colors you used in the bedroom. I agree with you, HG's pillow selection has been pretty awesome lately. Thanks, Kristi. Yes, I need to stay out of HG. Always fun visiting your beautiful home. Love your beach inspired touches! Kim - love your home inside & out! Your dining room enchants me! And that seagull photo is something special - great shot! Happy Summer!! Kim!! Swung by to see your tour. Everything looks fantastic and I LOVE the pot rack with the goodies and dried flowers. Happy Summer! Your home is always lovely and I especially like this summer coastal French farmhouse look. Kim, you have such a creative and oh, so beautiful way of adding summer to your home!!! I'm lucky to say that I have had the pleasure of visiting your amazing home and seeing all the lovely decor!!! You give me my dose of upscale French daily! Wonderful to be on this tour with you! I don't have a tape measure right now, but the dough bowl is a few feet shorter than the table. Loving all the splashes of color. The blue inside the cabinet is so genius! Bravo. Happy to be on this tour with you. Your guest room looks perfect to me and I'm so tired since I'm kicked out of my Cottage for renovation, I'd love to spend a night in your beautiful room! 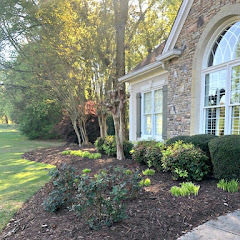 Your home looks beautiful and all ready for summer, Kim! I love all of your summery decor Kim! Your collection of white dishes is stunning - I love to collect them too! So fun to e a part of this amazing bHome tour with you! Happy summer!